In 2010 we started building sequencers, and frankly we never stopped, but we were never going to build ordinary X0X0X0 sequencers, we wanted something that was generative and unique, something that would surprise us from time to time with its output. Nothing too out there you understand, different but still usable. So we built the four smart machines included here (tho‘ you could count them as 5 instruments as included here is the un-released River:Chromatic). It took a couple of years to get them right. Now here they are all packaged up together as a little family of sequencing bedfellows. Will they replace your DAW? No never, but they will give you very fast access to new and interesting (and maybe different to your usual) melodic structures. You can of course point their MIDI output at your own samples, or synths but the included sounds can be very effective too. Is it Tenori-on? Is it Monome? No its GRID MACHINE//MATRIX! the coolest most cost effective way to get into grid-based audio. GM//MATRIX is a massively powerful, engaging, fun way to develop unique melodic content from literally under your finger-tips. 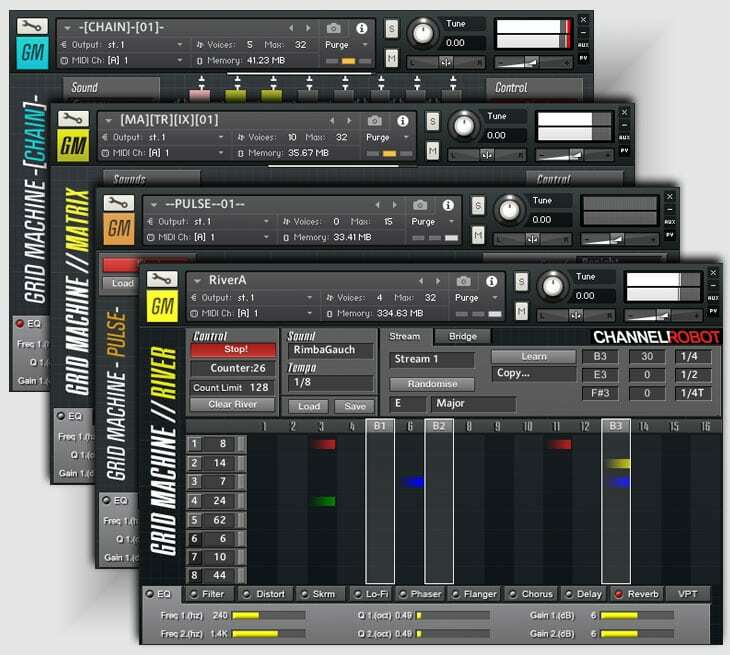 Featuring 50 sound-banks in 5 Kontakt instruments all meticulously multi-sampled for use in the instrument by GM//MATRIX creators ChannelRobot. Sounds custom designed to match the grid based approach and for use across a wide range of genres from DnB, thru Dubstep and on into House and more. Rich, fat analog leads and basses, shimmering pads and leads and in the unlikely case that they’re not what you want GM//MATRIX outputs MIDI thru Kontakt to your favourite synths for even more creative possibilities. GM//MATRIX features nearly 30 different pattern approaches, heaps of scales and keys, variable tempos and velocities, random notes and stutter repeats all allowing unlimited new melodic content, as commercial or as dark as you need. Grid Machine//River, is an innovative phrase player for Kontakt 5+. River comes with over 160 multi-sampled percussion instruments and provides users with an innovative new approach to the creation of percussion tracks and loops. 8 streams each playing a user-defined three-part phrase contribute to unique new and poly-rhythmic output. Easy to use and creative River is a new approach to developing your own percussion and rhythmic output. Designed to have users up and running with whole new tracks within minutes and providing endless variations and possibilities with just a few mouse clicks River can be controlled and played using the included key-switch system. GRID MACHINE//CHAIN, the third instrument from the grid machine series comes set up to deliver cascading melodic grooves for use in every genre of modern electronic music. From simple Phillip Glass like endless repeats, thru house key parts and on into downtempo atmospheric hooks. Not just simple 4/4 grooves either, Chain can build bubbling strange time signatures thru three/four, five/four, six four time and on. Anything that needs a melodic twist, or anytime you need melodic inspiration Chain is there to provide the input. Use the internal sounds or route Kontakt to your favourite synth for your own entirely unique compositions. Featuring 50 sound banks custom designed and multi-sampled. Endless engaging varying patterns are available at your fingertips. All this from a new approach to sequencing, that will have you building completely original tracks straight away. GRID MACHINE PULSE, machine number 4 from the grid machine series comes set up to deliver strange unique melodic grooves for use in every genre of modern electronic music. From every type of cinematic piece, thru house melodic parts and on into downtempo atmospheric hooks. Atmospheric and restless, to calm and hypnotic the possibilities are endless. Anything that needs a unique melodic approach or anytime you need melodic inspiration Pulse is there to provide the input. Use the internal sounds or route Kontakt to your favourite synth for your own entirely unique sounds. Featuring 20 PULSE presets and 5 Template Instruments custom designed for use in Grid Machine Pulse. Endless engaging varying patterns are available at your fingertips. All from yet another new approach to sequencing, that will have you building completely new inspiring original tracks straight away.